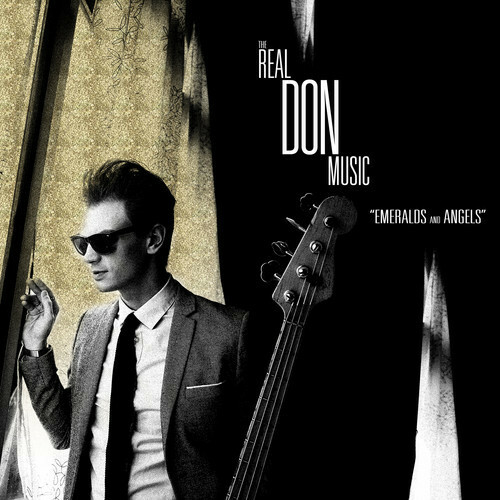 The Real Don Music – "Emeralds and Angels"
Kirk Huffman must have been taking notes when he went on tour with Portugal. The Man and the RX Bandits back in 2008, as his new song "Emeralds and Angels" plays on many of the elements that make up their trademark sounds. Borrowing heavy bass-lines intermittent synths and soothing horn melodies, Huffman has released "Emeralds and Angels" as a debut song under his new name The Real Don Music. As "Emeralds and Angels" kicks into gear, there is an immediate tie with the funk/experimental-driven instrumentals and John Gourley-like vocals from Portugal.The Man, which remains untouched for about a minute. After a sample chimes in, namedropping both Seattle and California, both places The Real Don Music is based out of, the vocals and background begin to shift. The clear Portual.The Man sound begins to blend with that of the RX Bandits before a sax solo solidifies the latter, complete with a brass and saxophone backing behind similar vocal runs. Kirk has always been musically inclined in different genres. While he initially became recognized for his musical talent as the bassist and contributing vocalist to the indie pop group Gatsby's American Dream, when they originally disbanded in 2006 he began taking his music in a new direction. Leaving no time for his creative juices to dry up, he simultaneously created two multi-member collectives in Kay Kay and His Weathered Underground, who opened for Portugal.The Man and RX Bandits as part of a west coast tour, and Wild Orchid Children. Proving that he was not tied down to any specific sound, Kay Kay was an ambitious melodic take on baroque pop with a retro twist, while Wild Orchid Children showcase his grittier-jam-band-meets-Rage Against the Machine-side. There is something exceptionally pleasing in discovering a band, or in this case a band member, who are able to reinvent themselves time and time again, providing a new take on previously established sounds. such a good song. can't wait to hear some more from kirk he knows how to make my ears tingle.